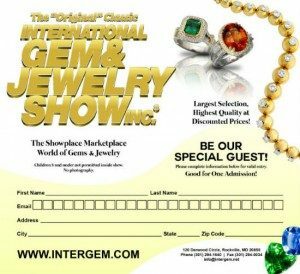 The Spring Dallas International Gem & Jewelry Show will be April 19-21, Easter weekend, at Market Hall. We will be in our usual location, booth 506, unless there are changes. You can find us on the floor plan easily. We do an ad to help you find us. The show hours are the same. Wishing you a Happy Easter and hope you can take time out from Easter Egg Hunts, Services and brunches to come out and see us and the new pieces we’ve been working on. You can download and print the ticket image below for free entry into the show.